Ahhh it’s that time again. PAX East is just around the corner, and we’re incredibly excited. We’re just under three weeks away, and boy do we have a lot of planning left to do, and we’re sure some of you do as well. Nonetheless, now is not the time to stress about that, now is the time to share what we have coming up both before and during PAX East! 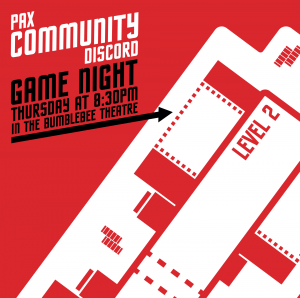 As most of you have probably heard, we’ll be hosting Game Night at PAX East! This marks one whole year of IRL Game Night events! That being PAX East 2018, PAX West 2018, PAX South 2019, and right back where it all started at this upcoming PAX East 2019. We’ve upgraded from the Arachnid Theatre to the Bumblebee Theatre, so be sure to come by and fill up the area with other PAX Community Discordians! At PAX South, we dipped our toes in a slightly altered format from previous events, and we plan to fully commit to these changes for PAX East. Some things that are changing are: reduced trivia (it’s fun, but shouldn’t take up 50% of the night), new games (to be announced, likely not before the event though! ), and a restructured ticket/prize system, more on that for the folks who attend the event. ABOUT PRIZES: If you’re curious about what the prizes will be, we don’t have the exact things to share with you right now, but something we can say is this: while having a couple “grand prizes” was cool and all, we’ve decided to gear prizes less from one or two large, “generic” items (more on that in a second), but instead, a good handful of event-exclusive items, with our usual mix in of PCD/Discord merch. By generic, we mean things you can obtain outside of the event, no issue. A Nintendo Switch or a gaming mouse is definitely a cool prize, but (1) technically speaking, money aside, you can always get one and (2) only a small number of Game Night attendees can win such prizes. With our new selection of prizes, we’ll not only be able to have more winners for prizes that aren’t just shirts or pins, but also be able to give people prizes that can’t be found anywhere else. We hope you understand the change, but would also be happy to hear feedback on it in the server. Feel free to post your opinion about it in #pcd-suggestions on the Discord server. We can’t wait to be back for another night of fun! Come join us Thursday night (March 28th) at 8:30pm in the Bumblebee Theatre to play games and win prizes! We have some pretty cool stuff in store as well for those that attend… you won’t want to miss it. OH YEAH! As long as everything goes as planned, this will also be the first panel to be recorded (by us, not by PAX itself) so for those that can’t attend, you should be able to watch highlights a few weeks after PAX East concludes. We’ll be hosting another PAX Prep stream over on Twitch! There, we’ll be covering the do’s and don’ts of PAX East, with some helpful advice that’ll be particularly useful for newcomers. We’ll be live Sunday night (March 10th) at about 9:15pm ET. If you tune in live, you can feel free to ask any questions you may have as well, and we’ll answer them right then and there. See you then! As it has been a tradition now for a while, anyone that ordered PCD badges or pins will soon be added to a private group of channels on the server. There, you will receive updates about when and where you can pick up your stuff during the show. Most of these meetups are relatively impromptu, so if you have issues attending any meetups on a specific day and you can’t attend for the rest of the event (or it’s Sunday late afternoon and you haven’t received your stuff yet), contact Andeh#0001 or myself (gfx#0001) on Discord and we can work out a time and place to make sure you get your stuff. Please try to be somewhat vigilant of the pickup channel prior to picking up your things! If you’re able to pick your things up early on, you don’t have to worry about it anymore for the rest of the event. Meetup locations usually last for about 20 minutes up to an hour or two, depending on the time of day. You can also pick up your stuff following the Game Night panel if you attend! That about wraps things up before PAX East. If you have any questions or concerns about anything here, feel free to ping Andeh or me at any time and we’ll respond as soon as possible. We’re super excited to be back in Boston, and we look forward to seeing you all in just under 3 weeks! But seriously… you won’t want to miss this Game Night panel. We have some really cool stuff brewing… ta-ta for now. Copyright © 2019	PAX Community Discord. All rights reserved.